While making a purchase on Amazon today I ran into a problem that I hadn’t had before. 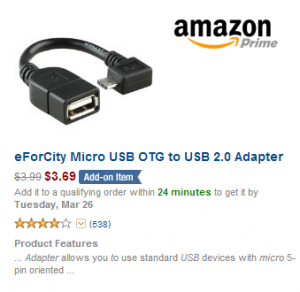 The thing that I wanted, the USB to Micro USB adapter pictured at the right was listed as an “Add-on Item”. I wasn’t adding it on to anything. I just wanted to purchase the cable and have it delivered with my Amazon Prime. However, that’s not what happened. When trying to check out with the item in my cart, I was informed that the item would not ship unless I had purchased $25 of goods on Amazon. I chose the appropriate option of “Prime Eligible” when searching for the item I wanted but that’s not what I got. I got another subset of items that ship only when I spend $25 or more. This is not an isolated “problem”. Why is this an Add-on item only? The Amazon policy is explained in their Shipping & Delivery section of their Help page. The policy is better explained by this Amazon Strategies blog post. So there it is. Amazon is getting rid one of the big benefits of Amazon Prime, effectively hobbling the service. Now, if you want that small item AND you still want to purchase through Amazon, you’ll have to buy it from one of the Amazon Partners that are willing to sell those small items one-sy, two-sy. Luckily, many of those partners will ship items for free as well. You’ll just have to wait the 3-5 days for standard shipping instead of the 2-day shipping that we were promised with Prime. I have to wonder why I’m only seeing this now though. I buy things on Amazon using Prime multiple times a month. Is it a larger roll-out? I only tend to buy larger items on Amazon?